Your siding is your home’s first line of defense against the elements – This features serves the vital task of keeping you and your family safe, dry and protected inside. Installing new or updating old siding increases insulation and thus reduces intense heat gains and/or losses that occur in extreme temperatures. Oh, and new siding looks pretty great too! How do you choose the right siding for your home? Replacing your home’s siding is a relatively simple way for a quick upgrade, enhancing energy efficiency, aesthetic appeal and strength. 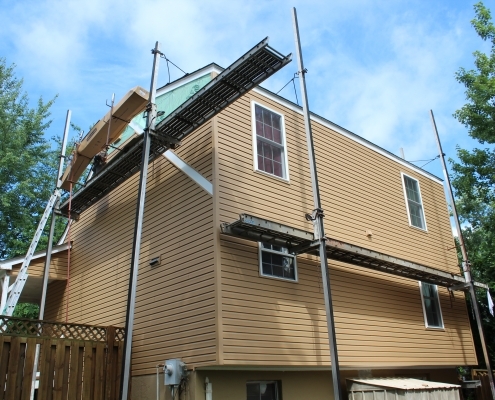 There are a wide variety of siding materials available on the market today, each with their inherent benefits and drawbacks. Vinyl is one of the most popular siding options, as it offers intense durability and strength, does not rot or flake and requires minimal upkeep and maintenance. Homeowners can get vinyl siding in a virtually limitless amount of colors and it is often the most cost-effective option among siding materials. At Top Dog Home Pro, we specialize in the installation of Alside vinyl siding. Made from a proprietary compound developed by engineers, Alside siding provides unparalleled quality and performance, durability, and beauty. PureStrength™: A vinyl resin that is the main ingredient in Alside vinyl siding. This material provides superior strength and weather resistance, preventing moisture infiltration in even the most extreme weather conditions. As well, PureStrength™ requires minimal maintenance and panels will not rot, warp shrink or swell. Ti-Shield™: Titanium dioxide that prevents ultraviolet degradation. Rest assured that your home’s siding will maintain a beautiful, undamaged appearance even in the hot summer sun. manufacturing process and after installation. TrueShield™: Impact modifier to provide unsurpassed impact resistance. This ensures your siding will resists dents and marks from routine daily activities. DesignersChoice™: Keep your colors bright. Pigment concentrations produce uniform colors that will go clear through the panel. Colors can’t be washed out because they’re ingrained in the panel itself. ChromaTrue®: A weatherable polymer that provides excellent fade resistance and performance on darker colors.